EUROPEAN FEDERALIST PARTY » PRESS RELEASE – EFP: Europe’s first transnational list present in 6 countries. PRESS RELEASE – EFP: Europe’s first transnational list present in 6 countries. Brussels – 5 May 2014. 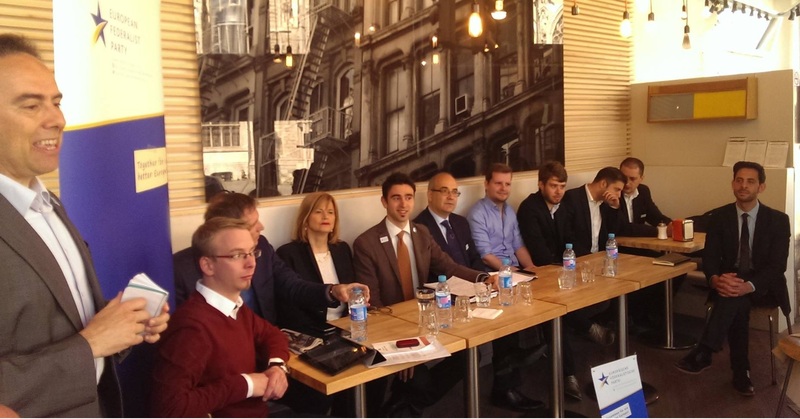 European Federalist Party (EFP) candidates from Austria, Belgium, France, Greece, Italy and Portugal presented their vision for Europe at a joint Press Conference yesterday in Brussels. EFP is the first-ever transnational party, with sections in 16 countries and with candidates for the upcoming European Parliament elections across the continent (a list of candidates is available here: www.votefederalist.eu) . “In stark contrast with the increasingly vocal anti-Europeans and nationalist parties that are rising in many European Countries, the EFP is convinced that the only way to tackle today’s and tomorrow’s challenges is by building a better Europe. A Europe that is more democratic, more efficient and closer to the people” noted by Pietro De Matteis, co-President of the European Federalist Party and MEP candidate in Belgium. The candidates stressed the cross-border character of the EFP campaign as “The EFP is the only party that does not stop at national frontiers” pointed out Bengt Beier, MEP Candidate in Austria. The existence of the EFP has also been instrumental for the creation of a federalist coalition in Italy, noted Marco Marazzi, Secretary General of the Italian section, and has forced other political parties to openly take a position on European federalism as noted by Catherine Guibourg, MEP candidate in France, and by Harry Stamelos, MEP candidate in Greece. The European Federalist Party advocates for a) the development of a “social Europe” based on a Europe-wide minimum income and a European safety net-complementary to national welfare systems- protecting mobile workers/students and job-seekers; b) the establishment of a European industrial policy facilitating the life of SMEs, the development of European industrial champions; c) the creation of an effective European foreign policy supported by one European diplomacy and army; and for d) institutional reforms leading to the election of the European Commission President and the reinforcement of the European Parliament by providing it the right of legislative initiative. “After building the Europe of the single market it is now time to build the Europe of citizens” noted Benoit Barbier, MEP Candidate in Portugal. This is even more important if we want to rebuild trust between the European citizens and EU institutions, especially in those countries severely hit by the crisis as underlined by Alfredo Saltiel, MEP Candidate in Greece. We cannot wait any further, concluded Pietro De Matteis: “Today’s youth and the next generations of Europeans will not excuse our inaction. The choice is between Europe or the decline”. Please see our press release in French, German, Greek, Italian and Portuguese. The European Federalist Party (EFP) is the only, truly, pan-European political party campaigning for a more democratic and federal Europe. The EFP was founded in 2011 by citizens from all over Europe and has since developed into a cross-border movement with sections in 16 countries. The EFP will have candidates running for the European Parliament elections in 6 countries and they will all be defending the same pan-European programme voted by its members at the 2013 EFP Federal Convention. The EFP contributed to the introduction of several pieces of European legislations including the European Citizens’ Initiative and the EU roaming regulation. Click on the picture below to know more about our candidates!